"Great Oaks from Little Acorns Grow" was the slogan adopted by the company in 1906. In 1906, the Dakota Mutual Life Insurance Company adopted a new slogan. Symbolizing the philosophy of its founders, the slogan “Great Oaks from Little Acorns Grow” used in the seal you see above. 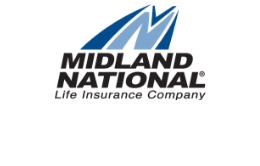 To see the story of the founding of the Dakota Mutual Life Insurance Company - which would be renamed Midland National - click here. Click here to see the history of all the marketing campaigns from Midland National's 110 year history.